Too many families lack the means to meet their children’s basic needs. Poverty directly impacts access to housing, food, child care, education, and health services, and indirectly affects the ability of parents to meet their children’s social and emotional needs – all crucial to children’s health, development, well-being and future success. 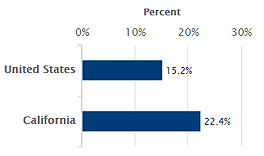 Kidsdata has released updated data on three ways to measure poverty: the federal poverty threshold, the Supplemental Poverty Measure (SPM), and the California Poverty Measure (CPM). These three measures have different historical origins and incorporate different components of poverty. As with all of the topics we address, details about how an indicator is measured are provided in the “Measures of” section under tables and figures. Kidsdata and the Population Reference Bureau recently reviewed data about poverty starting at birth. Learn more. 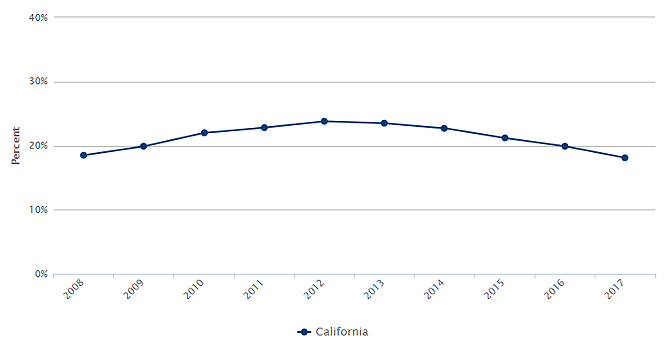 How are California children faring? Based on the federal poverty threshold, 18% of California children who were ages 0 to 17 were below the family poverty threshold of $24,858 in 2017, similar to the rate a decade ago. This measure compares pre-tax cash income against a threshold of three times the cost of a minimally adequate diet in 1963, adjusted for inflation. It is best used for measuring poverty over time, and it forms the basis for some administrative determinations. Based on the SPM, 22% of California children who were ages 0-17 were in poverty in 2016. This measure builds on the official poverty measure by accounting for expenditures and resources such as utilities and state-level differences in housing costs and government benefits and tax credits. It is useful for national and state comparisons. 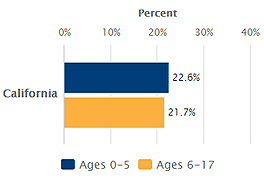 Based on the CPM, 23% of California children who were ages 0-5 were in poverty in 2014-2016. The CPM refines poverty measurement by accounting for expenditures and resources that are California-specific such as regional differences in housing cost. It is best used for in-state assessments and comparisons. Policy and programmatic planning can influence poverty, even in areas where it may not seem relevant. For example, transportation planners might consider how public transit routes can efficiently connect their higher poverty and more rural constituents to health facilities. Addressing child poverty is essential to assuring a vibrant social and economic environment. California’s Future, a publication from the Public Policy Institute of California, provides an objective assessment of the housing crisis, health care, education system and more. April 1, 2019 signals that there is one year until National Census Day, the reference day used for the 2020 U.S. Census. The Census Counts Campaign offers suggestions on ways to raise awareness of the critical importance of participating in the Census. We recently released data on Family Income and Poverty. This release brings you 47 indicators including new breakdowns by legislative district. The topic includes data on poverty, deep poverty and concentrated poverty. Also in this topic, we include previously released data on poverty among mothers who recently gave birth. See links to the latest here. This entry was posted on Monday, April 1st, 2019 at 4:28 pm. You can follow any responses to this entry through the RSS 2.0 feed. You can leave a response, or trackback from your own site.